I’ve recently discovered todo.txt. For anyone already with a todo.txt on their desktop it’s a fairly simple concept. Just a set of standards and ways of writing your todo.txt file to make it easier to read, use and compatible with loads of third party apps. I definitely recommend giving it a go. date (+time), number, small text, positive and negative tags, context tags. 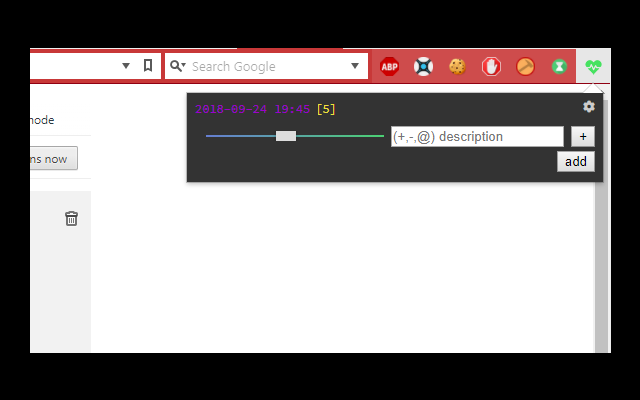 New lines should always be placed at the top of the file, this means when you open moodlog.txt it’s simple to add a new log as you won’t have to scroll ages if the log has been going for a while. Dates should be in ISO format (largest value to smallest) eg. year-month-day hour:second, I would recommend using 24hr format so you do not get confused weather was am or pm. This should be a simple number from 1-10 wrapped in square braces  which represents your current mood. Fairly simple. Just a small description of what you are doing, how you feel, anything you want to remember really. Tags can be either positive or negative and as such should start with either a “+” or “-“. These should be one word and is useful for pattern recognition in the future by filtering. For example when I filter to show all days with tag “+code” I notice these days generally have a higher overall happiness rating. And that is all there is to it. I have made some things to make this easier to use which are below. If you make anything let me know and I’ll add it to the list below also. It’s able to easily add new logs to the file. Filters make it useful for gaining insights and patterns about good / negative experiences. Has a small API for third party developers to use. A plugin that notifies at a random time (between 3-5 hours) and allows posting to the moodlog_web api. This entry was posted in Uncategorized by Ross Marks. Bookmark the permalink.